how the hell does that even happen???? Ha the captcha is $1.5 million decayed! Reminds me of the dream scene from Hugo. Anyone else think so? ALL ABOARD THE FIRST FAILROAD! "nahh we don't need one o those fancy cranes"
Oh crap! It's the pedal on the left!! Thomas the Steam train after some scotch and a martini. I told him to stop I swear. this, my freinds, is why they couldnt use a train in back to the future. It is the old Montparnasse station in Paris, France. 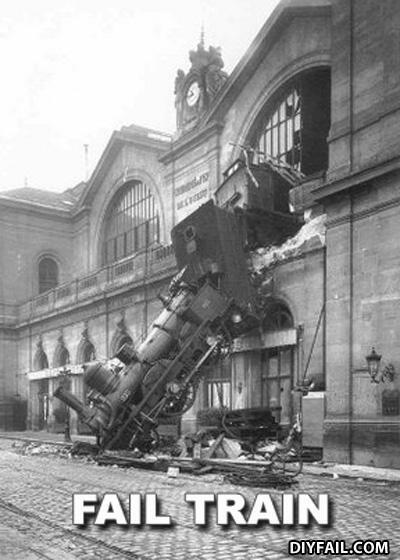 This accident happened in 1895, the engine overran the buffer stop and finished off the station.